Thank you for building such a wonderful pool for us. Now we can hang out in our backyard. Thanks again! You guys did a great job. I can’t thank you enough for a great experience. When we started dreaming of a pool, we weren't sure we would be able to afford it. However, when we saw Steve's plan for our pool, we knew we had to do it. His design skills are exemplary even when working within our limited space and budget. The execution of our pool could not have been smoother. 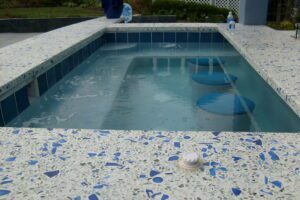 The end result is a pool we are proud to have, and an experience we were glad to have been a part of. Having a pool built in my own backyard is one of the best decisions I’ve made. My search for a contractor didn’t take long after I met with Steve. He was extremely thorough with the design plans, provided me with lots of options, took the time to detail every step and proposed a very reasonable estimate. Once the work began, Steve and his crew were timely, professional and treated me as well as my property with respect. If the crew ran into an obstacle, Steve contacted me immediately for an agreed upon resolution. No shortcuts were taken; in fact they even went above and beyond the contract to ensure the job was completed with the highest level of quality.Steve is easy to work with and has been great about following up to ensure everything is fine. I am extremely pleased with the job that was completed by Steve and his crew. Steve was very professional and provided solutions for repairing my spa. He didn't stop until he had it fixed correctly. It was an older spa and we ran into a lot of problems, but Steve didn't quit until it was repaired. I appreciate all the hard work you put into my spa repair. Thanks! Our dream of having a pool installed in our backyard consisted of several months wondering when we would be able to afford it. We met with various pool contractors that just could not satisfy answers to our questions and concerns. We then had the pleasure of contacting Mr.Steven King of Stranger Creek Pools and we immediately knew our search was over. Steve and his crew went above and beyond all expectations throughout the project’s start, end and post finishing to make sure the experience was exceptional. Flexible and driven are two words that come to my mind when I think of Mr. Steven King. We cannot say enough positve things about the overall experience with Steve, his crews and the overall planning, construction and finishing process. 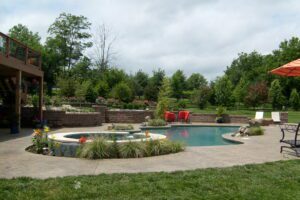 Bottom line: If you are interested in building a pool and looking for top knotch, turn­key customer service, quality craftmanship, and friendly , helpful crews....look no further than Stranger Creek Pools. Steve and his crew were friendly and professional. There were here working on our pool just about every day, and even some weekends to get the project done in a timely manner. We were kept up to date on the status of the project on a regular basis and every question and request we had was answered promptly. Steve was very helpful in offering suggestions for the pool design and material selections, and very flexible in making minor changes to the design once the project got underway. The end result is even better than we had hoped for and we highly recommend Stranger Creek Pools to anyone looking for a beautiful, high­quality pool/spa. Copyright @ 2019 | Stranger Creek Pools, Inc.